The area shown above is for the Republican Basin Study. The Republican River Compact Administration (RRCA) Model area extends to the entire Republican River Basin, including the portions of the basin that are located in Kansas and Colorado. The area addressed by the Republican River Basin Study lies upstream of Hardy, Nebraska and includes the Basin’s upper reaches, extending into Colorado and Kansas. Additionally, in order to include all groundwater that may be associated with the Republican River Basin, the study area extends beyond the Basin’s boundaries, from the Platte River in the north to Ogallala Aquifer outcrops in the south, east, and west. Original modeling efforts were conducted using the Republican River Compact Administration (RRCA) Groundwater Model in 2002. That RRCA Model simulated the effect of historical surface water and groundwater uses on basin water supplies, but did not assess the impacts of the region’s water management practices. 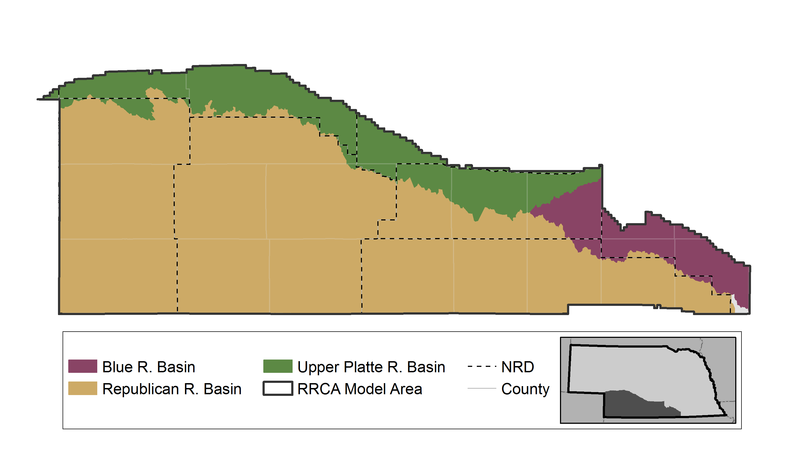 The RRCA Model continues to be updated to account for the effects of new water uses in the basin. Through the U.S. Bureau of Reclamation’s WaterSMART Program, the three Republican River Compact states (Nebraska, Colorado, and Kansas) are updating the model to evaluate potential water management scenarios and improvements to infrastructure and operations. The RRCA Model includes a surface water operations model, groundwater flow model, and soil-water balance model. Implementing a conjunctive management approach is necessary to maximize water use without diminishing ground or surface water supplies in this fully appropriated river basin. Subject to demand enforced through interstate agreements, high-quality water data are essential for managing Nebraska’s allocation of the Republican River’s water supplies while also meeting the objectives of the Basin’s integrated management plans.